Today I wanted to remind everyone that red pandas are close to going extinct. They are so cute and adorable. It saddens me that they are hunted and their habitats are being destroyed. 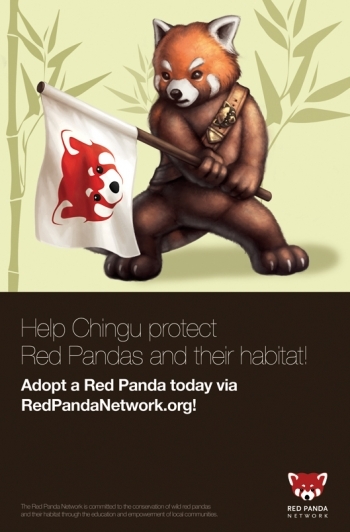 Please donate to the Red Panda Network and help save this precious animal from going extinct. I now have the desktop wallpapers section fully updated with brand new designs. I love them so much! I can't decide which one I like the best. Too bad I can't have multiple monitors and have a different image on each screen. It's so hard to choose. Hopefully you'll have better luck picking out the one you like the most. Go check them out in the FREE GOODIES section of the website. I'm excited to say that I believe I now have the website all in order, as far as the look and coding go. The only exception is that I'm working on a different splash page. I'm now moving on to the next item on my agenda and that is making brand new freebies. I hope to have them uploaded soon. Stay tuned! I'm excited to say that Flurry is getting a new makeover. The website is now under construction. It's "technically" still operational, but from time-to-time some things might look odd as I try to make some improvements. I'm extremely pleased with the new color scheme and background images thanks to Francois and Tony. You can see their awesome work via the link to their websites on the credits page. Right now I'm updating some of the pages with new artwork. I'm happy with the new images for the characters, locations, creatures, and items on their respective pages. It's all coming together very nicely. The freebies are next on my list to update with some cooler stuff. In fact, there are many projects in the works right now. I'm itching to reveal all of them to Flurry's adoring fans very soon. Until that day, keep checking back. I have a lot of fun things to share with everyone. I plan on making some exclusive content to be available only for visitors to Flurry's official website right here. Stay tuned!